I don't know if it is the schoolboy that still resides in me or what but I find that i've ended up with quite a number of items in my collection that have `transport ' as a theme in one shape or another. This one is about `trains'. It is described as a `jeton de presence' but at 50mm it is the largest `jeton' i've ever heard of. Clearly this is where the whole subject of `is it a jeton or is it a medal?' gets really fuzzy. I'm uncertain as to the date of issue as the information on this piece seems to be fairly scant. It was however engraved by A. Temarque and issued for the opening of the new Gard du Nord in Paris circa 1865. The obverse shows an industrial scene with a train running through it. The allegorical figure depicts the fruits of the commercial activity brought about by the rail link. The reverse shows the Gard du Nord. 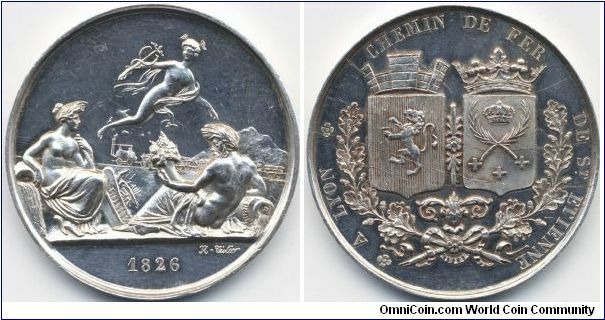 Very nice medal Ian, Coinarchives give the name thus A. Sabauque dated 1900. Looking at the style of the Locomotive I would guess it is 1930's vintage steam engine. The design of the train is indeed the best indicator of the date of design. The train is a type 231 which places it late 1890's -1912. The Gard du Nord is a bit of a red herring in relation to trying to date the item. The station was redesigned and completely rebuilt under the auspices of the Rothchilds in the 1860's. The Compagnie du Chemin de Fer du Nord itself ceased to exist in 1937 when it became a part of the national rail system SNCF. Perhaps the item was struck as a final memento for the board members and highlighting the `glory days'. 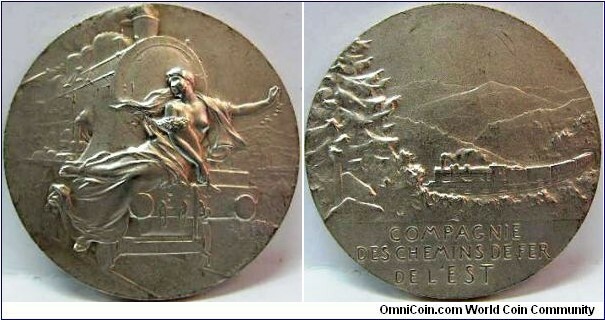 Here's an example (in bronze) of the `Compagnie des Chemins de Fer de L'Ouest' that was struck in 1909 to commemorate the company being in administration! Today, that thought would be quite bizarre! The company was taken over by `Chemin de Fer de L'Etat', a state owned railway board that had been set up some years previously as a `bail-out' for a number of smaller and floundering railway companies'. This company became the fore runner for the formation of SNCF in 1937. 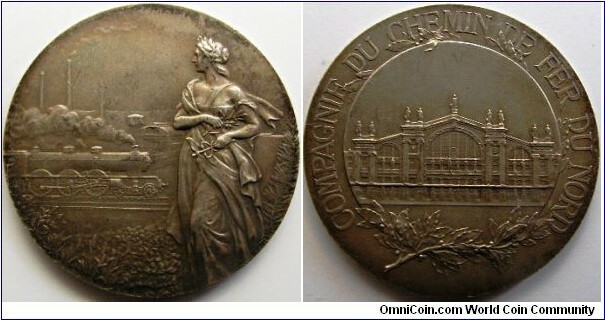 The obverse of the medal depicted below appeared on earlier medals (in both silver and bronze) when the railway represented was having greater success. 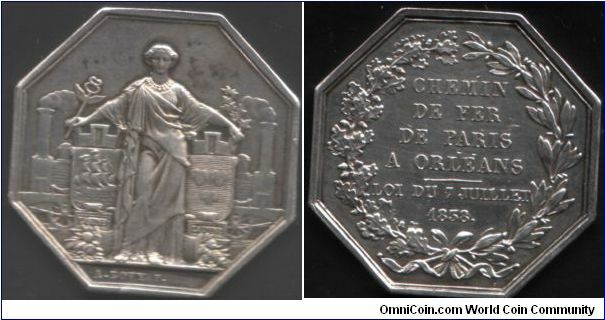 Curiously Monnaie de Paris still has a medal with the same obverse but different reverse in their catalogue that commemorates Science and Industry - I know because I bought one in their boutique at Quai de Conti a few years ago and it is sitting in my china cabinet. It's not uncommon for the Paris mint to do that. they have a lengthy history of using good designs more than once. Here's another few from my `train set'. Compagnie des Chemins de Fer de L'Est, engraved by Frederic Vernon circa 1900. Compagnie Chemin de Fer de Lyon a St Etienne. This line was commenced in 1826 but was not fully completed until 1833. First `trains' were horse drawn, so this medal / jeton de presence is most likely to have been struck to commemorate the full opening of the line. Wow, Ian. What's the relief on the Vernon piece? Shall we say it's a bit shy of what could have been achieved (if gauged against swiss shooting medals for example). The design of the train is indeed the best indicator of the date of design. The train is a type 231 which places it late 1890's -1912. The 231 was the 'Pacific', the Germans first showed interest in this design type of Loco in 1905, the French in 1906 but production was delayed till after WWI, though as early as 1909 some early ones were used in Alsace-Lorraine. The COMPAGNIE DU CHEMIN DE FER DU NORD. use of the 231. 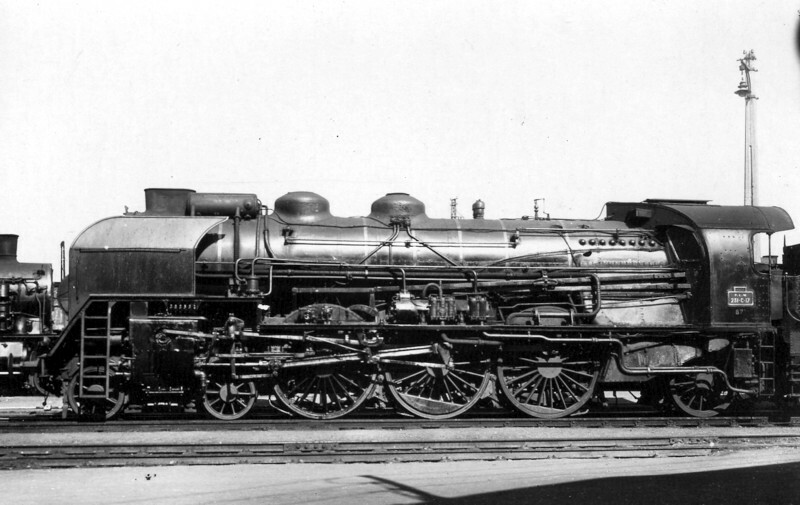 The 231 C Nord was a class of 4-6-2 (Pacific type) steam locomotive of the Chemin de Fer du Nord. It served in the North of France and Belgium. The first batch were built in 1923, and last remaining were retired from service in the 60's. These locomotives were widly known as super-pacifics due to their high performance, which made them famous even in Britain. The French locomotives of that era with their smoke lifters etc were some of the most attractive locos around. With the Mallet compounding they were also some of the most efficient in terms of energy being used - they effectively used the steam twice over as opposed to just once. Certainly the CF du Nord was operating long before the 231 C (Nord) came into existence in 1923, So it would be reasonable to assume (across a very wide chasm of ignorance I may add..... ) that they were using the 230 B 's and probably the 231 B's before they took delivery of 231 C's. The first record I can find of their purchasing a loco was the `Eugenie' which was built by Fairbairn for the 1855 Paris Expo. The loco is definitely a 231, not a 230 if you look at the rearmost of the 3 large wheels in the pic of the 230 it protrudes under the cab, on the 231 all the large wheels are in front of the cab(with the 1 in 231 representing the small wheel under the cab). The 231B though built in 1914 was not delivered until after the war. The list shows when each type was actually delivered to the Nord lines. So if what is shown is a 231A then 1912 should be the earliest it would be on the Nord line. If 231B, 1919 if 231C, 1923. Great fun, I rode on the 'Flying Scotsman' which is a 231( known in England as a 462 as they count the wheels both sides) just a few years ago, in fact I have a picture of it hanging on my bedroom wall. Nice headlights on this one. My first thought was --Is she being hit by the moving train? It kind of looks like that. That looks chest right to me. 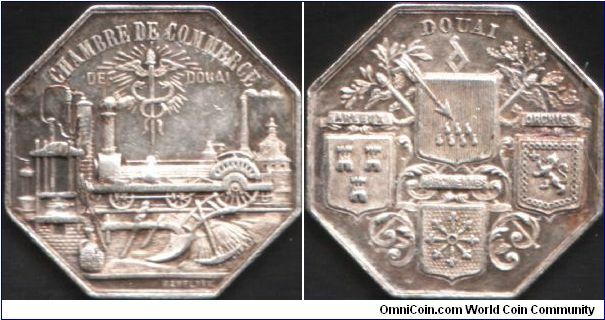 A jeton issued by Douai Chamber of Commerce and commemorating the Paris to Douai railway provided by the Compagnie des Chemins de Fer du Nord. 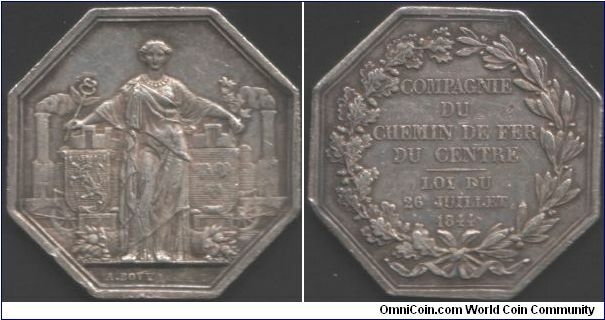 a jeton issued in 1844 to commemorate the opening of the line from Orleans to Chatearoux. All mammary references aside, that is a beautiful medal Ian! Looks more like an expresso machine, just kidding Ian, very nice early locomotive. 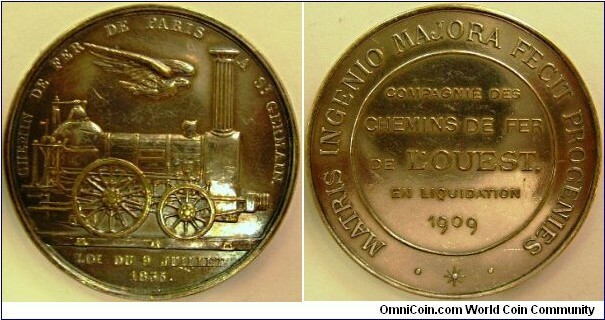 .......just pity that they didn't make the image of the locomotive a bit larger / more prominent on the medal. It does look like it would make a decent expresso or capuccino! 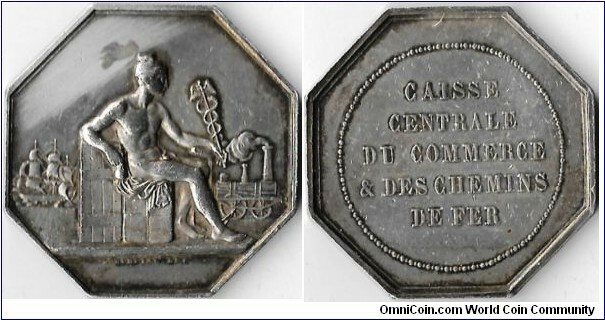 Finally managed to get hold of an example of the jeton issued by the `Caisse Centrale de Commerce et des Chemins de Fer'. It's a jeton relevant to `banking' , `trains', `boats', and `general commerce'. The scarcity falls into the category of `scarcer than hen's teeth' and only rarely surfaces on the market...and usually requires significant financial outlay. Fortunately for me I saw this one apparently before the rest of the world was awake ......and got it at a relative bargain. Unfortunately most `bargains' come with some form of baggage and this one is no exception. if you look at the obverse, running from mid lift to top right you will notice that the colouration is lighter than the rest of the jeton. This is due to some cretan having tried to `smooth' out a flaw in the planchet. The `flaw' is an indentation that looks as if a piece of the jeton has flaked off. It is most likely due to a dirty die where a piece of debris has been struck into the planchet and then fallen off, leaving the indentation. It might also have been caused by a bad metal mix when the planchet was first made, but unlikely. Ah well.....c'est la vie as the saying goes. Beautiful. The "polishing" is part of the story. I love that this hobby appreciates wear and original patinas and toning.